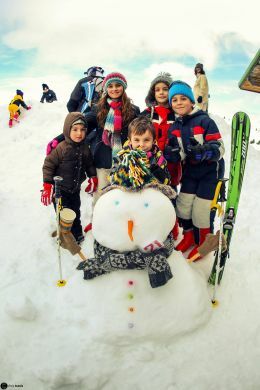 On January 20 2013, the celebration of the World Snow Day was accomplished with great success in the Kalavrita Ski Center. 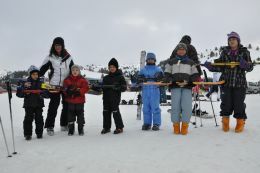 The events started early in the morning, when over 100 children arrived at the Kalavrita Ski Center with their families. After the coordinated efforts of the ski center staff and event organizers, we have managed to provide free transport by bus, free accommodation, free food and drinks, free ski passes, free ski rental and ski lessons for all the children. We also provided great discounts to the parents at all the above services, including the “All Inclusive Ski” package that runs exclusively at our ski center. 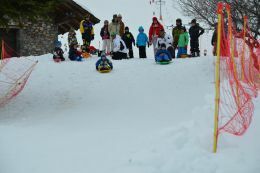 -Sledge race and snowman making contest for children. All the children got free commemorative photos and fabulous gifts from our sponsors. -Free ski and snowboard lessons for all the children 5-12 years old from the qualified instructors of all the ski schools at Kalavrita Ski Center. Their use of skis and snowboards was free. -It is important that kids have the freedom to be active on the mountain, but we also want them to be safe, so there was a brief seminar regarding winter sports safety tips by our instructors. -During all day, inside the Chalet ‘1750’, there were free drinks and food for children and important discounts for their parents. There were also projections of videos of winter sports. -Unfortunately, due to bad weather conditions, the scheduled show by skiers and snowboarders at the Snow Park of the Kalavrita Ski Center had to be called off. All of our activities were organized focusing on the safety of our little friends. Despite all the poor weather conditions and the alterations that had to be made, we managed to accomplish the goal of giving joy and special memories to all our visitors. All of the event participants were enthusiastic and left with big smiles on their faces. We are all looking forward to World Snow Day 2014!